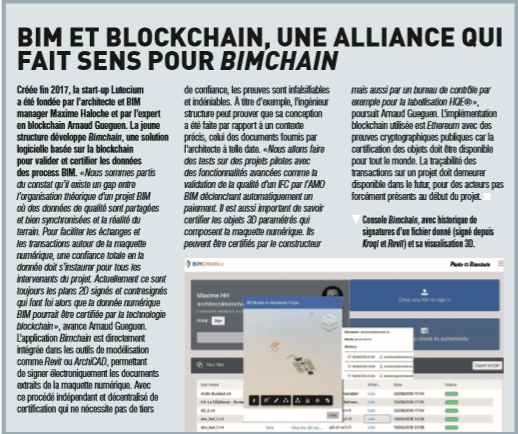 BIMCHAIN is featured in the December issue of Qualité Construction Magazine. Under the headline “Cooperation Built on Trust” the report covers many aspects of the industry where Blockchain technology bring value, including BIM. The following content is the full translation into English in which we explain how certiﬁcations can be delivered directly on the Model and BIM Objects, removing the need for paper and adding value to the BIM Data. Founded at the end of 2017, the startup Lutecium was founded by the architect and BIM Manager Maxime Haloche and the Blockchain expert Arnaud Gueguen. The young company BIMCHAIN, is developing a software solution based on the blockchain to validate and certify BIM process data. “To facilitate exchanges and transactions around the digital model, Trust in the DATA must be established for all project stakeholders. Currently it is still the old- fashioned way of signing and countersigning 2D plans that are authentic whereas the BIM digital data could be certified by blockchain technology “, argues Arnaud Gueguen. BIMCHAIN application is directly integrated into modeling tools such as Revit or ArchiCAD, allowing electronically sign documents extracted from the digital model. With this independent and decentralized certification process that does not require a trusted third party, the proof of work is tamper-proof and undeniable. For example, the structural engineer can prove that his design was made in relation to a specific context, that of the documents provided by the architect on a specific date. We are now testing pilot projects with advanced features such as AMO BIM quality validation that triggers a payment automatically. It is also important to know how to certify the parametric 3D objects that make up the digital model. They can be certified by the manufacturer but also by a control office for example for HQE® labeling “, continues Arnaud Gueguen. The blockchain implementation used is Ethereum with public cryptographic evidence because the certification of objects must be available to everyone. The traceability of transactions on a project must remain available in the future, for actors not necessarily present at the beginning of the project.